Please refer to our stock # 11003 when inquiring. This amazing vintage pin is a hard to find "Jelly Belly" example from the 1940's. Carved from lucite, many of these pieces are believed to be made from post war surplus material. The material was a recent invention and mimicked the look of rock crystal which was extensively used in fine jewelry at the time. This pin measures 3 1/4" long x 2" wide and stands almost 1" thick. It is made from base metal and has a rich gold tone plating with pave crystal accents. 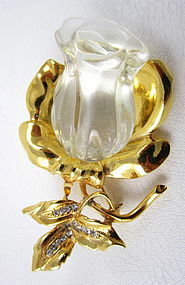 The pin has been professionally replated and restored and looks beautiful when worn. There is some minor natural foxing on the lucite carved bud and there are some darker plating sections where the 3 leaves converge. I have photographed this but it's unfortunately exacerbated by the high resolution photos. The pin is gorgeous in person.